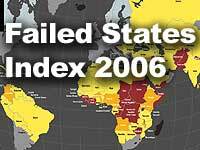 Failed States Index 2006 shows which countries are at risk of going belly-up. Sudan topped the second annual Failed States Index [FSI], published by The Fund for Peace and the Foreign Policy journal. Zimbabwe, however, saw the steepest slide in the index. We’ve established that we like development statistics that are easy to read and understand. F.S.I. 2006 is not as visually appealing, but its 12 indicators provide another standardized way at interpreting how states evolve or devolve. Wonder why some of these states are failing? Wonder no more. A photo essay by Jan Banning shows police, city and state officials working for little or no money around the world. The best example? A Liberian county governor had no money for an office, which locals built with their own money. They ran out of cash to build windows or a door. Sudan (112.3 points) has been wrecked by a seemingly intractable conflict in the Darfur region. The Democratic Republic of Congo (110.1) ranked second. CÃ´te d’Ivoire and Iraq came in third and fourth, respectively, and are also no surprises. Zimbabwe, Pakistan, Nigeria and China skidded by 10 or more points, while stability increased in Venezuela, the Dominican Republic, Guatemala and Bosnia and Herzegovina. The most stable countries? Finland, Sweden and Norway.